Matthew Potts and Cameron Steel have been challenged to build on their breakthrough 2017 campaigns as Durham prepare for the new season. Wearside bowler Potts impressed after making his debut last summer, taking 14 wickets in five Specsavers County Championship Division Two games before injury ended his season early. California-born batsman Steel made a big impact, with 899 first-class runs, with a notable knock of 224 against Leicestershire. Coach Jon Lewis said: “You have to be impressed by how they seized the opportunity. Professional sport is unforgiving at times. It is often about timing. “Can you be in good enough form to grab the opportunity or can you be good enough for long periods whether or not an opportunity is coming up? “Gareth Harte was our second team player of the year last season, but he never really had a crack in the first team. You wonder how that has happened. “The timing was an issue whereas it worked for Potts and Cameron. “The huge challenge for them now is becoming consistent players. That’s the difference between talent and potential then going on to becoming an established part of the team. 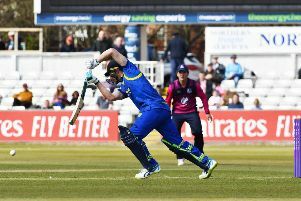 Potts got his chance when the now departed Graham Onions and Paul Coughlin were injured, while Steel capitalised on the exits of top-order batsmen Mark Stoneman and Scott Borthwick to Surrey. Lewis added on durhamccc.co.uk: “Although Stoneman and Borthwick left, how much cricket would Cameron Steel have played if they had been here? “How much of an opportunity would Graham Clark have had? Would Potts have made his debut? “It’s easy to see the downside and there is a downside – no doubt about it. “But there are people who benefit from that and it’s good for us that we’ve had them. Cameron particularly took his chance last season. “I did not know an awful lot about Pottsy at the start of 2017, but, by the end of the season, he would have been a first pick had he been fit.